Illinois state agencies and community partners are working together to create a new state of mobility through Autonomous Illinois. 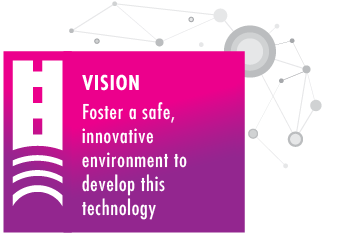 Our goal is to be a national leader in the development and use of connected and automated vehicles (CAV). We’re increasing our agility in a changing market and amplifying Illinois’ natural leadership role in transportation, distribution and logistics. CAV technology is progressing rapidly and will dramatically change the way people and goods move throughout Illinois. Passenger and commercial vehicles are already using varying levels of this technology on our roads. Debate continues about how soon new features may become accessible to the majority of consumers and businesses, so we must prepare now. Our top priority is keeping the Illinois transportation network and roadways safe for travelers. CAVs and other assistive technologies (including those already in use) can potentially reduce the number of crashes, prevent injuries and save lives. 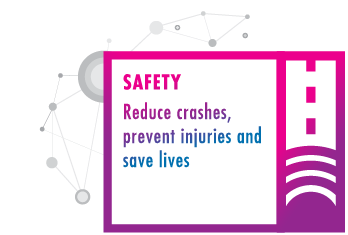 Illinois’ crash and fatality numbers continue to increase, so it’s imperative we explore every option to improve safety in our network. Passenger and commercial vehicles with various degrees of automated capabilities travel safely throughout the state, alongside non-automated vehicles. Companies proactively come to Illinois to develop, test and bring their products to market because of Illinois’ world-class CAV ecosystem. Goods travel efficiently and safely through Illinois maintaining the state’s economic advantage as the hub of the North American freight network. The state operates and delivers services effectively and efficiently with the use of CAV technology. CAVs travel into and out of Illinois seamlessly because of regulation and coordination at federal, state and local levels of government. Needs are anticipated, and technical training and curriculums are developed to prepare a changing workforce. Learn more about our vision. 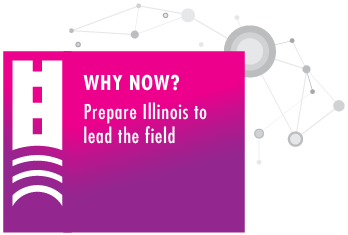 Work with us to make Autonomous Illinois a reality. Autonomous Illinois encourages safe and responsible testing and demonstration of CAV technologies. Participating entities should notify the state of their intention to use public roads for testing. Notify us to participate in the testing program. Description: Innova EV has partnered with Choose Dupage and the Village of Itasca on a first mile-last mile solution connecting employees and residence of the Hamilton Lakes Business Park to and from the Itasca train station. Description: : Autobon has partnered with MSD Express, Inc to retrofit MSD fleet vehicles with Autobon’s advanced highway autopilot system. In the current phase, MSD Express’ retrofitted vehicles are collecting extensive system performance and roadway data that will be used to further the development of Autobon’s future autopilot technology. Description: Innova EV has partnered with ComEd on a pilot to provide transportation to residents of The Renaissance Collaborative (TRC) Senior Village at 346 E 53rd St.. Residents of the Village can schedule rides in Innova’s Dash EV to take them to neighborhood destinations such as the grocery store, public transit stations, the pharmacy and other neighborhood retail centers. At present, the vehicle includes a locally hired driver. Rides are $3 each way. They have recently expanded this pilot to include two additional buildings. The Innova EV Dash is a 100 percent electric vehicle. The car has a range of 150 miles per charge of its lithium-ion battery and a maximum speed of 35 miles per hour. The Dash is an IoT (Internet of Things) connected vehicle with more than 40 built-in sensors that collect data about the car’s performance and ridership statistics. "Speeding Toward the Future of Driverless Cars "
"Driverless Cars: Promising, But Bumps In The Road"
"The upstart that hopes to be first with a driverless car"
What is an automated vehicle? 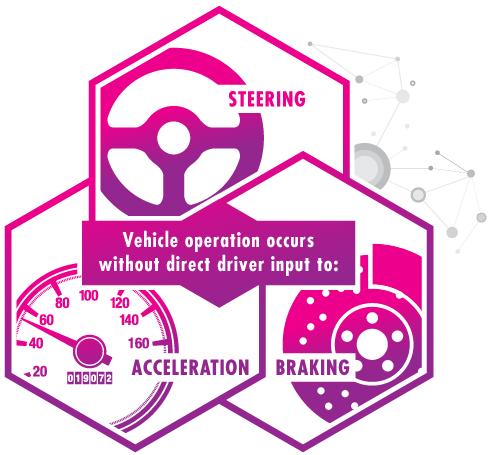 A vehicle in which operation occurs without direct driver input to control steering, acceleration or braking. These actions are collectively referred to as the dynamic driving task. What are the levels of autonomy? * Levels 0-3 are currently the only levels allowed by Illinois law. Legislation will be required to allow for level 4 or 5 vehicles. What is the difference between a connected vehicle and an automated vehicle? Connected vehicles wirelessly communicate with each other, the internet and devices installed on streets, such as lane sensors and traffic signals. They acquire and share information, such as when a signal will turn green, yellow or red, or precisely where other cars are on the road. Automated vehicles are driverless or self-driving vehicles capable of sensing their environment using artificial intelligence, sensors, cameras, global positioning systems, and other hardware and software to drive without human input. To discover all the benefits that CAVs have to offer, both connected and automated technologies need to be developed, tested and deployed. What are the safety benefits of CAVs? CAVs and driver assistance technologies (including those already in use on the roads) have the potential to reduce crashes, prevent injuries and save lives. The National Highway Traffic Safety Administration estimates that 94 percent of all serious crashes are due to human error or choices. CAVs have the potential to greatly reduce these errors, the resulting crashes and their impact on society. We want to hear from you. Send us an email at the address below and we'll get back to you as soon as possible.